This compact hoist features a high efficiency motor with convenient 2H4V push-button operation. Single or three phase power available. Unit is dust and water resistant, load limit fitted, and features a 4:1 safety factor. Chain container included. Ruggedly built with power to handle most industrial lifting applications. Includes push-button hand pendant with raise and lower functions on a 6' cord. Single and three phase AC power available. Optional Chain Container stores surplus chain overhead to keep from interfering with operation. Additional lifting heights and speeds available, contact factory. Single Phase units can be configured for 115 or 230 Volts. Contact factory for assistance. Variable Speed Electric Chain Hoist makes it easier and faster to lift your product. These add exceptional value, since these hoist save on maintenance, repair, and downtime costs over its lifetime. Standard with push button hand control with up and down controls, and variable speed knob. Chain container included. Features inline hand grip which allows one handed operation and gives the operator a free hand to easily position the load. Rocker switch above hand grip for quick selection between low and high speed control. Adjustable speeds and single phase power. Lightweight and compact die cast aluminum body. Chain container comes standard. 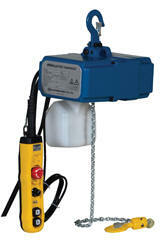 This high speed single phase electric chain hoist offers the ability to lift heavy loads with ease and precision. Light, compact and powerful, this hoist can be easily installed, transported and offers high lifting speed. Features include double braking system for added protection, heavy-duty motor for industrial applications, high performance friction clutch to prevent over-winding and corrosion-resistant nickel-plated load chain. Standard with chain container. Heavy duty air chain hoist can be used as a workstation hoist or as a production line hoist. Lightweight, rugged and compact design - for ease of portability - makes this hoist perfect for most air hoist lifting applications. Standard lift is 10 feet assuming 90 PSI air pressure. Variable flow, two lever pendant for precise load spotting. Lightweight and compact design ideal for a wide range of applications for construction sites, rigging, warehouse, storage area, confined spaces and plumbing. Easily mounts to most scaffolding and beams (secured with latch hook). Robust design, strong steel construction and durable powder coated finish. Dual braking systems provides instant and safe braking. Built in raise/lower limit switch prevents excessive winding. 360° swivel hook with safety latch. Thermal overload on the motor for added safety. Quick disconnect power and hand control cord. Low noise and smooth operation. Cable length is 90 feet. Hook Plate must be ordered for attaching hoist to a trolley (trolley not included). Hand pendant control cord is 5' long. Drill Powered Hoist for powered lifting in remote locations. 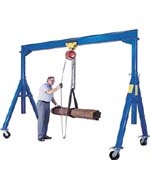 Hoist can be used in single or double line pull. 230in-lbs. input torque required for maximum lifting capacity. Equip your Gantry or Jib Crane with a top quality Hoist & Trolley.